QuickBooks 2009 is a flexible and robust software accounting program designed for use by small businesses to help organize and manage all areas of your company's finances. 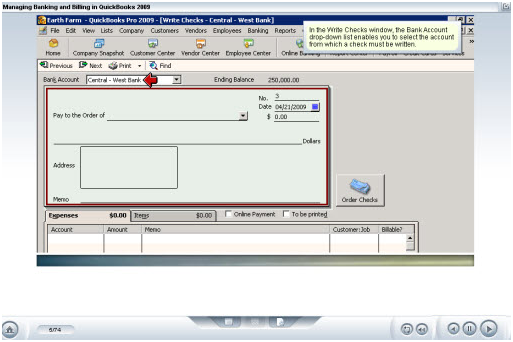 Our training course covers the fundamentals of working with QuickBooks Pro 2009. It provides an overview of the interface explores basic operations, such as creating a company file, adding customers, vendors, accounts, and items to a company file. It covers the basics of QuickBooks Help, as well as features of centers, lists, and forms. In addition, the Customer Center, Vendor Center, and Employee Center and the methods of working with these centers are explained. You will learn about creating item lists and forms, such as invoices, sales receipts, and purchase orders. The tutorial demonstrates methods of protecting and backing up data. Additionally, you will be introduced to the process of managing banking and billing transactions and the concept of payroll. 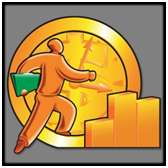 The course explains the process of creating reports and budgets is also covered. Our training is appropriate for those users with very basic accounting and accounting software skills who wish to use QuickBooks for their business purposes.